The new Titleist 718 AP1, AP3, and AP2 irons. Like the 716 model, the new and improved Titleist 718 AP1 ($125 per club steel, $140 graphite) is aimed at players looking for maximum distance and forgiveness with the look and feel Titleist players prefer. To maximize long iron launch and ballspeed, the newest AP1 4-5 irons feature a hollow construction with a cast body and thin, stainless steel face insert that creates more flex at impact. To improve launch and MOI, over 50g of high-density tungsten is positioned in the interior toe area of the 4-7 irons while the 6-PW feature a progressive 360-degree undercut channel. The results are new AP1s that produce approximately 2.6 mph more ballspeed and over five-and-a-half more yards of distance than the 716 model. To further improve overall performance and turf interaction, the entire set features pre-worn leading edges. The new AP1 is available in 4-PW, 48°, 53° wedges with choice of Mitsubishi Tensei graphite or True Temper AMT Red steel shafts. The totally new 718 AP3 ($162.50 per club steel, $187.50 graphite) model is aimed at players who want enhanced distance and forgiveness with the feel and control of a more compact iron. Bridging the gap perfectly between the game-improvement AP1 and player-oriented AP2, the AP3 produces approximately six-and-a-half more yards in carry distance than the 716 AP2 with one-and-a-half mph more ballspeed. The AP3 does the job with a hollow blade design in the 3-7 irons, each of which also contains an undercut design and an average of 84g of tungsten weighting in the heel and toe areas. A cast body and a 455 stainless steel face insert further contributes to ballspeed and distance in the longer irons while a 17-4 stainless steel insert in the 8-9 irons adds slightly more accuracy and control. Meanwhile the wedges feature a solid cast body and face for the ultimate in precision on scoring shots. The 718 AP3 is available in 3-PW, and the 48° wedge and comes stock with True Temper AMT Black steel shafts. Not to be outdone, the 718 AP2 ($162.50 per club steel, $187.50 graphite) irons carry on their Tour-proven performance by providing approximately two-and-a-half more yards of carry distance over the previous 716 model. The improved distance and overall performance of the new AP2 comes from a forged high strength steel body, a 2.1mm face insert in the 3-6 irons, and a 3.0mm insert in the 7-iron as well as an average of 57.4g of high-density tungsten heel and toe caps for added MOI and stability. The 8-PW feature a forged carbon steel body and face for enhanced precision and control. The new 718 AP2s are available in 3-PW, and the 50° wedge comes with a True Temper AMT Tour White steel shaft. Along with the three new AP Series irons is the new 718 T-MB ($249 per club steel, $280 graphite), a utility iron that has become so popular players are using them in full sets. Features of the new T-MB include a hollow body, cast construction with high speed face inserts, high-density tungsten weights in the heel and toe (91.5g average in 2-7 irons, 48.7g average in 8-9 irons) for enhanced stability and MOI for forgiveness, as well as pre-worn leading edges (2-7) for improved turf interaction. An optimized progressive CG location improves launch and spin rates throughout the set. The new 718 T-MB comes standard with True Temper Project X PXi steel shafts and are available in 2-PW. 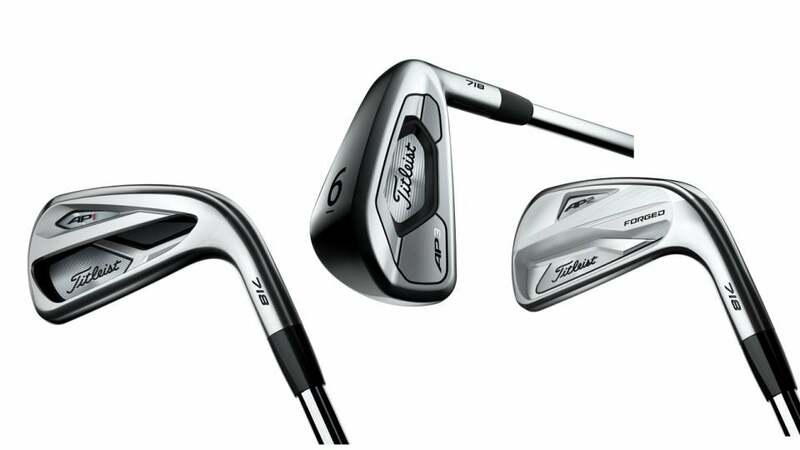 For players who still want a traditional forged iron, Titleist has definitely not forgotten about you, as evidenced by the final two new 718 irons, the CB and MB (both $162.50 per club steel, $185 graphite). The CB irons feature a traditional forged cavity back design with the addition of high-density tungsten (average of 74.8g) in the heel and toe areas of the 2-7 irons for improved MOI and forgiveness as well as a 3.1mm face insert for improved ballspeed, launch and distance. The 8-PW clubs feature a one-piece forged construction for maximum accuracy and feel on scoring shots. The 718 CB comes standard with True Temper Project X LZ and is available in 2-PW. As expected, the 718 MB is a one-piece, forged muscleback iron aimed at the most accomplished players. Available in 3-PW with stock True Temper Project X steel shafts, the new MB features weighting that’s positioned directly behind the sweetspot for optimum feel and shotmaking ability. All new Titleist 718 irons will be available at retail on September 29, with fitting beginning on September 1.